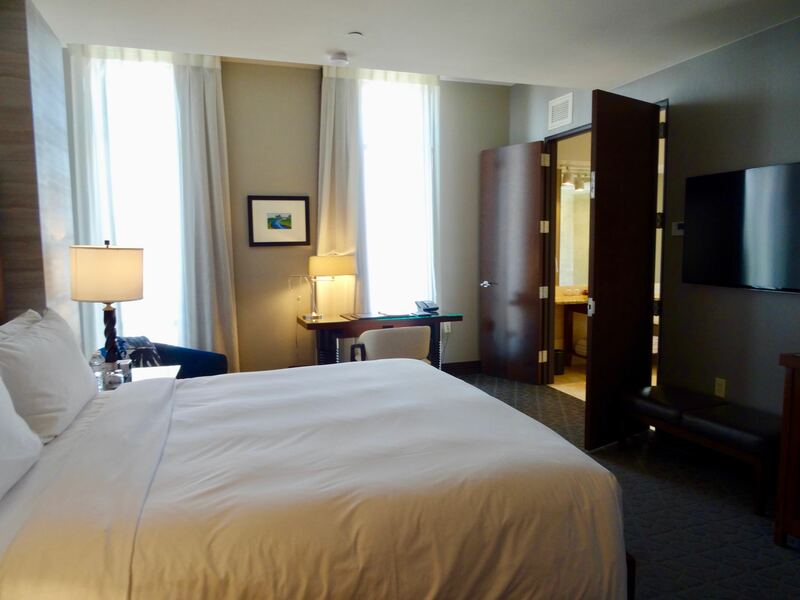 On a sunny spring day, I arrived at the Hotel Ivy Minneapolis for a tour. 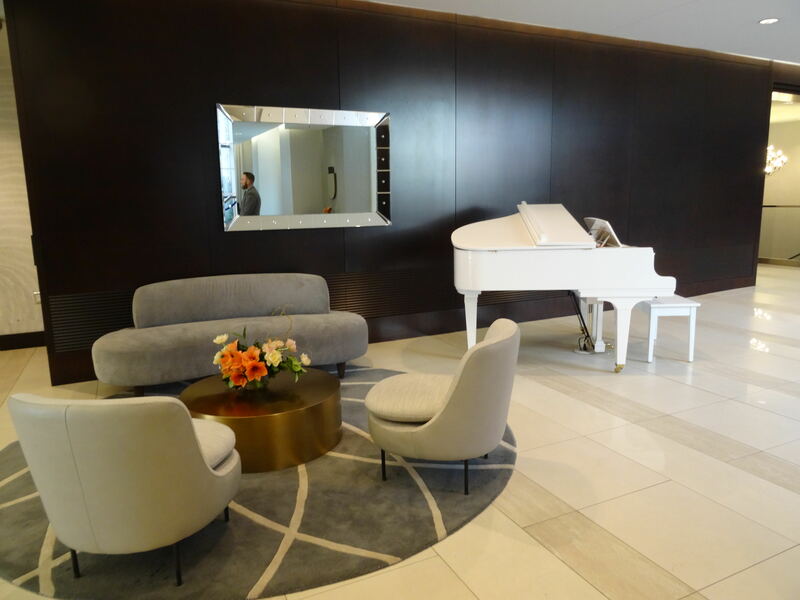 I was greeted by the doorman/valet attendant, and walked into a light-filled lobby with stylish seating areas, soft music playing, and an eye-catching self-playing white grand piano. 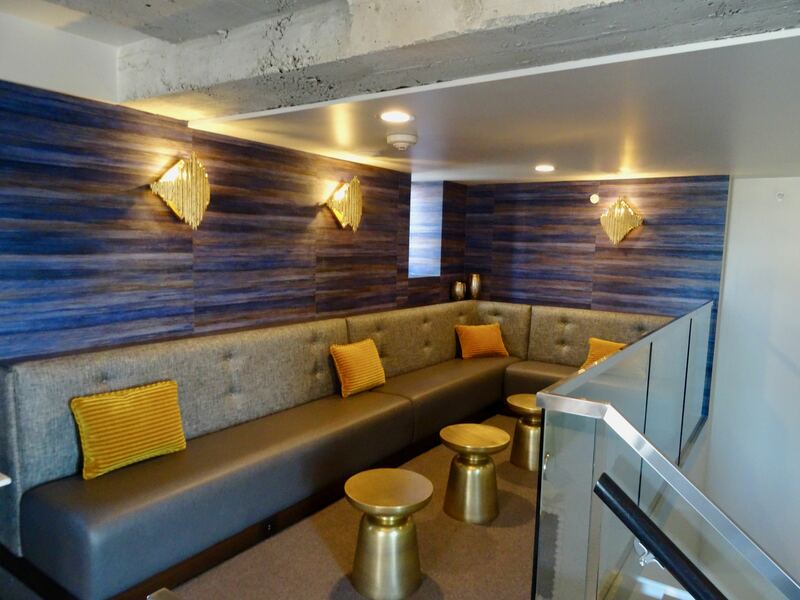 The recently reinvigorated lobby bar offered plenty of seating to lounge, catch up on emails, or enjoy a cocktail. From the lobby, we visited the third floor. 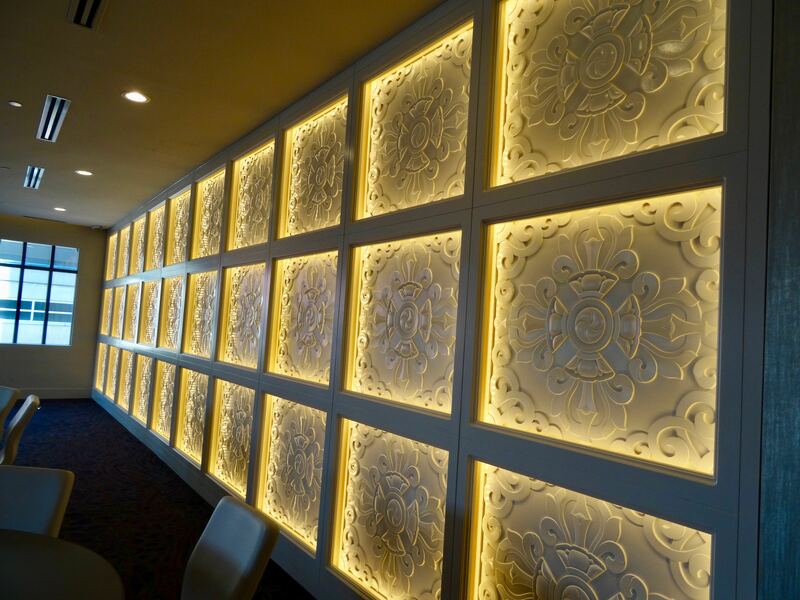 Designed as the hotel's event floor, there were several meeting rooms, a chic ballroom space in the historic part of the Hotel Ivy Tower with large windows for natural light and downtown views, and a statement wall with white hand-carved tiles from Thailand. Plus a flexible gathering space with stylish furniture, movable bar, and large meeting venue with audio visual equipment. Continue reading below the photo of the hand-carved tiles. During my visit I had the opportunity to see three room types in the 136 room property. The first was the Classic Room in the new tower. Featuring tall windows and 10-foot floating ceilings, this smartly-designed space had a custom armoire, large desk, a velvet chair by the window to sit and take in the view, as well as a plush king bed and new flat-screen TV. Continue reading below the Superior Guest Room photo. 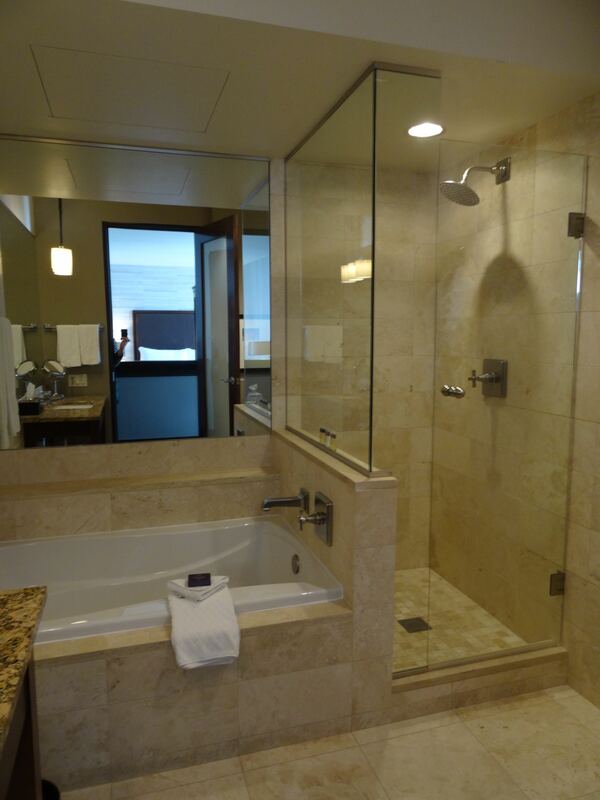 While the four-piece limestone bathroom had a deep soaking tub, glass-enclosed shower, and spacious vanity with spa-inspired bath amenities. 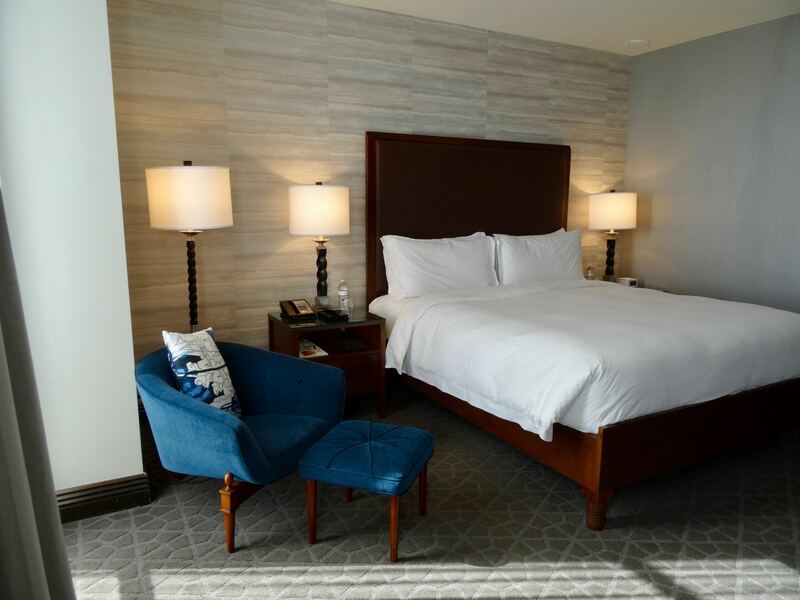 Read more below the photo of the Superior Guest Room. 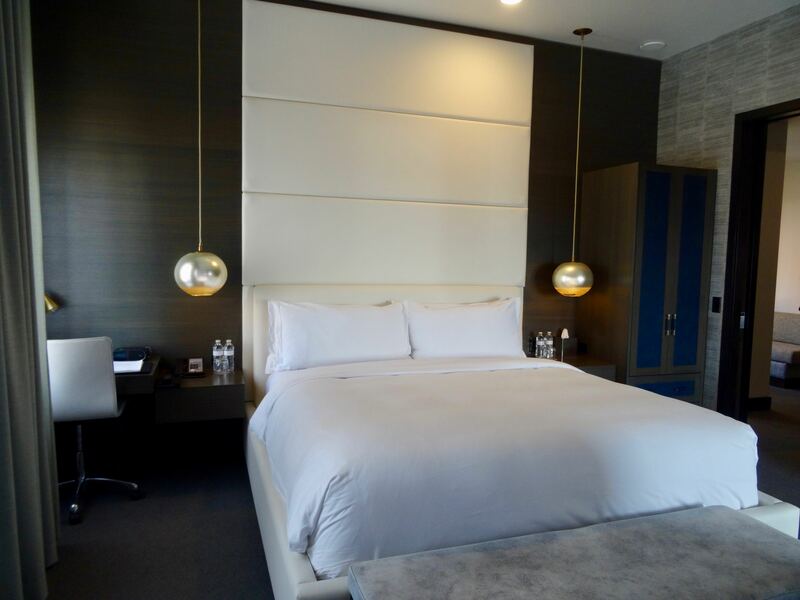 For additional space, the Grand Deluxe Room offers a more residential feel with a larger entry, additional space in the bedroom area, and an open feel with the 10-foot ceilings. Read more below the photo of the room. Infused with local touches like the "Minne" Bar providing guests with locally-sourced snacks and beverages (offered in all guest rooms and suites), and walls adorned with local photography, this room had a work desk by the window with downtown views. 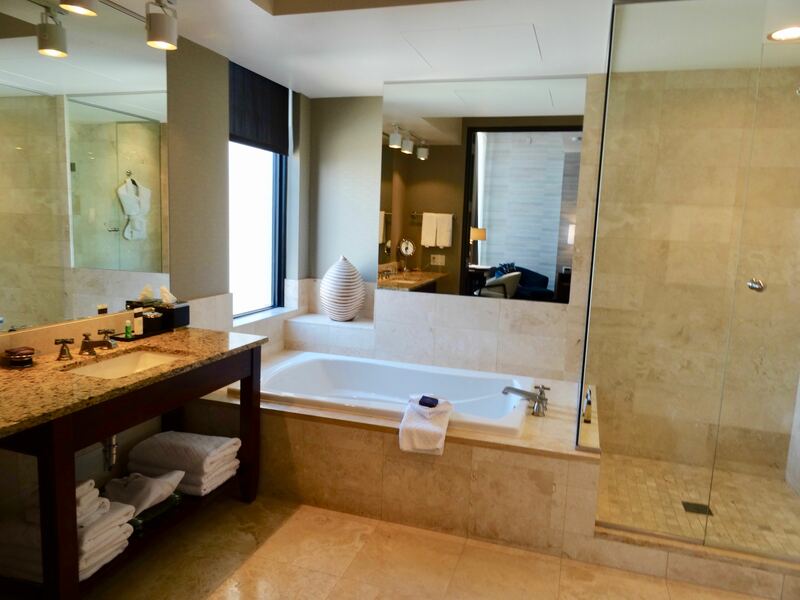 Plus, a spa-inspired limestone bathroom with plenty of room to relax and rejuvenate after a day of meetings, travel, or adventures. Read more below the photo. Next up was the spectacular Penthouse Suite. Featuring furnishings designed by an interior designer for a residential-style feel that would be an exclusive setting within the hotel, this two-level suite on the ninth floor, (the top floor of the historic tower) is a contemporary suite where guests enter via a stylish entry with a fully-stocked bar complete with an array of some of the finest bottles of Dom Perignon. Read more below the photo. From there is a spacious living room, guest bathroom, and a large lounge area overlooking the city. 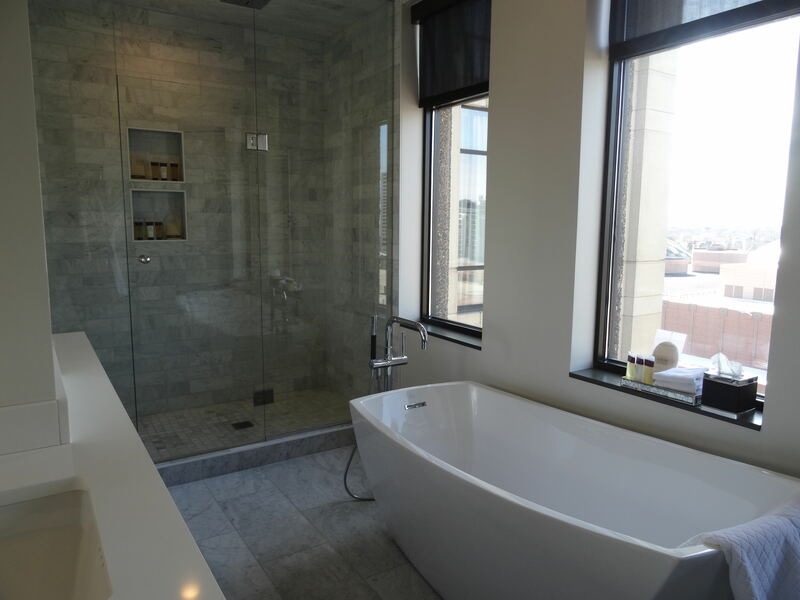 Off the living room is the master bedroom with a large king bed with custom furnishings, desk, and master bathroom with dual sinks, in-mirror technology, soaking tub providing city views, and a glass-walled shower. Continue reading below the photos. 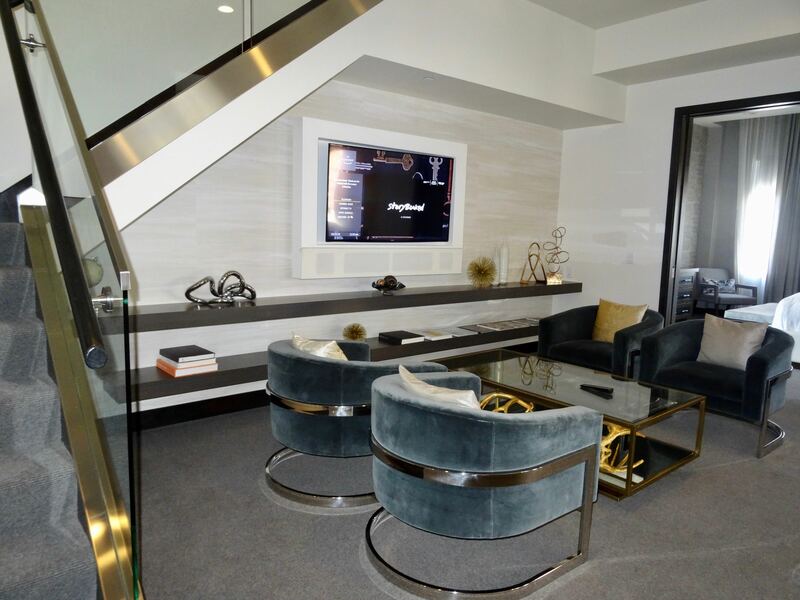 The second floor, reachable via the statement staircase is a chic en-suite lounge space with a long, lounge-like sitting area, bar space, and a statement chandelier designed to accent the building's historic architecture. Read more below the photo. But perhaps the crown of the suite is the balcony. 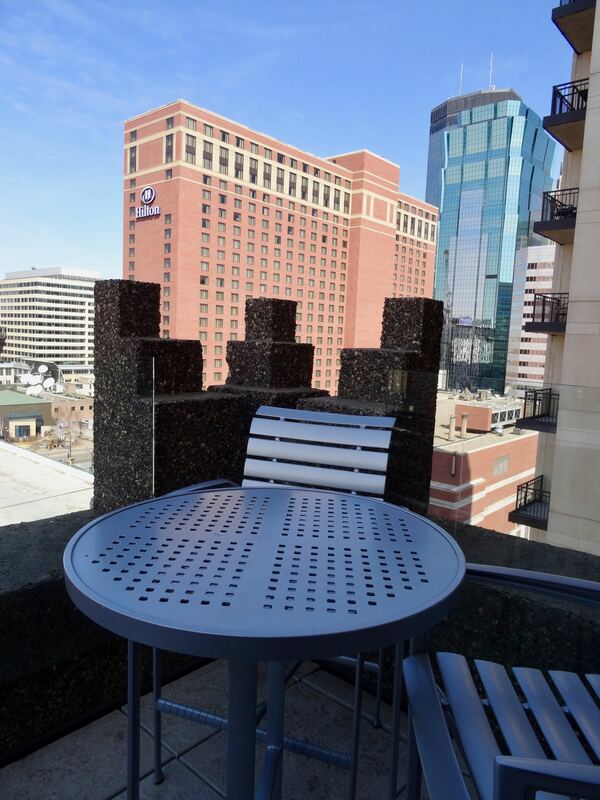 Reachable via the second floor of the suite, the balcony is nestled on the top floor of the historic Ivy Tower with two patio tables ideal for sipping cocktails while soaking in the views of downtown Minneapolis. Continue below the photo. I had the opportunity to have lunch at the hotel's Monello Restaurant. 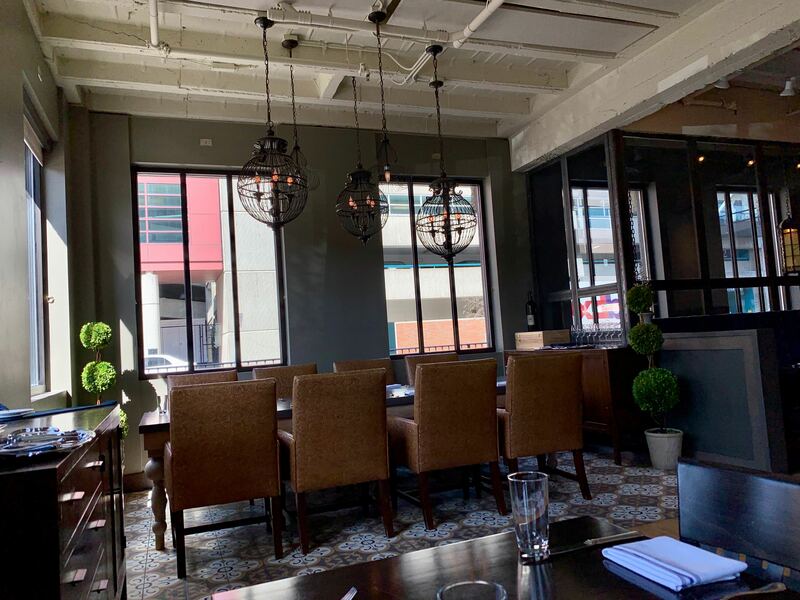 Featuring fresh Italian cuisine, pastas are housemade, there's large windows for natural light, and the overall atmosphere is upscale and modern, yet comfortable and approachable. During the warmer months there's an outdoor patio area ideal for cocktails in the heart of the city. 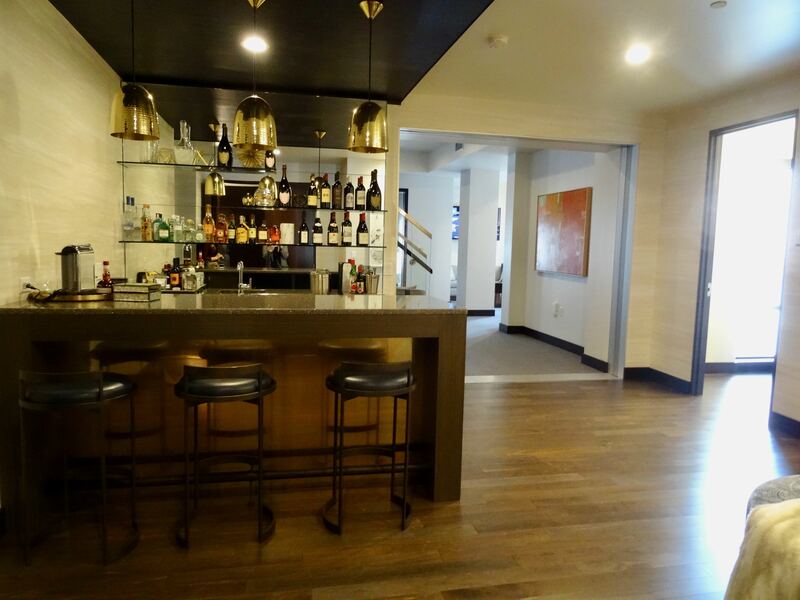 There's also the lobby bar, and Constantine with a chic, locally-infused retreat for drinks and small plates. Read more below the photo. The property's spa is undergoing a massive renovation and will reopen in summer of 2019. Four-legged friends are welcomed at the property with a pet-amenity bag, and there's a dog park just a few blocks away. Plus, the property is connected to the skyway system of downtown Minneapolis. Reachable via the third floor of the hotel, this 9.5 miles of enclosed pathways connects 80 city blocks within downtown Minneapolis, making it easy to reach offices, restaurants, bakeries, banks, theaters, doctors, art exhibits and more without ever stepping foot outside (perfect during the chilly winter months). FIVE STAR ALLIANCE PERK: Guests booking the "5 Star Signature Package" rate or "Best Available Rate" will also receive continental breakfast for two daily in Monello Restaurant, a $100 Food & Beverage Credit per stay, and complimentary WiFi.